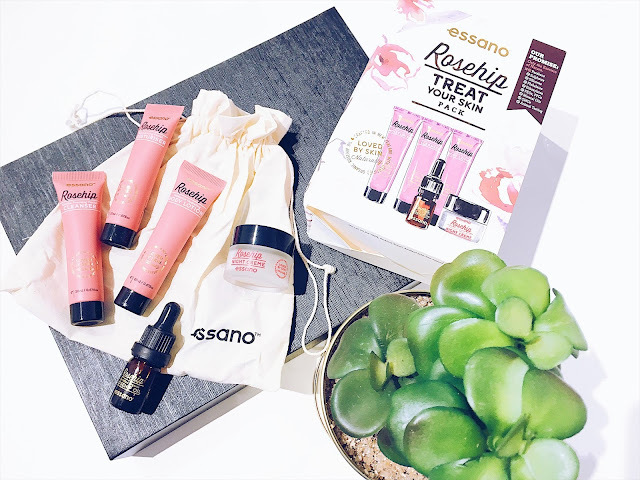 With Mother's Day just around the corner, I will be unravelling some gift guide ideas starting with Essano's Treat Your Skin pack. Essano have recently collaborated with Australian Illustrator Erin Whitty to produce a range of limited edition artwork for Essano's best selling products which is the perfect selection for their Treat Your Skin pack. It's the perfect pack to gift your Mum for this Mother's Day as it contains all of the top products she would definitely use and they come in travel sizes - making it perfect for travelling or even packing it in carry-on baggage. Gentle Foaming Cleanser - 20ml - Contains certified organic Rosehip oil and Aloe vera for the extra hydration benefits. This cleanser looks to gently cleanse your face and it doesn't strip the natural oils off your face. Regenerating Facial Moisturiser - 20ml - Contains active botanicals which works to deeply moisturise your skin as well as leaving your skin feeling very rejuvenated and refreshed. Intensive Hydrating Body Lotion - 20ml - Also contains the certified organic Rosehip Oil, Aloe Vera, Jojoba Oil and other much needed vitamins. Overall, this body lotion smells amazing and leaves the skin feeling so nourished. Certified Organic Rosehip Oil - 3ml - There's enough in this little bottle to last you about a few weeks (considering that you use only about 2-3 drops) of the Rosehip oil. I guess most of you would know by now of the magical effects of using Rosehip oil...if not, let's just say that it works deeper to condition the skin as well as prevent further stretch marks from forming. Moisture Restorative Night Creme - 10g - Last but not least, we have their night creme which works to promote your skin's elasticity overnight as well as looking to really boost your skin's moisture levels. This is perfect for if you suffer from dry or dull looking skin. So in a nutshell, the Treat Your Skin pack by Essano is suitable for all skin type including sensitive skin. It's such a lovely and useful pack to pick up for your Mum as it contains five amazing samples that she can look to road test. The pack is also illustrated by Erin Whitty which features a beautiful water-coloured background of florals and also of the Essano products itself. What are your thoughts on the new Treat Your Skin Pack by Essano X Erin Whitty? Thank you Essano for supporting me for this review. My reviews are based on my own experiences and I only recommend products that I truly believe in.